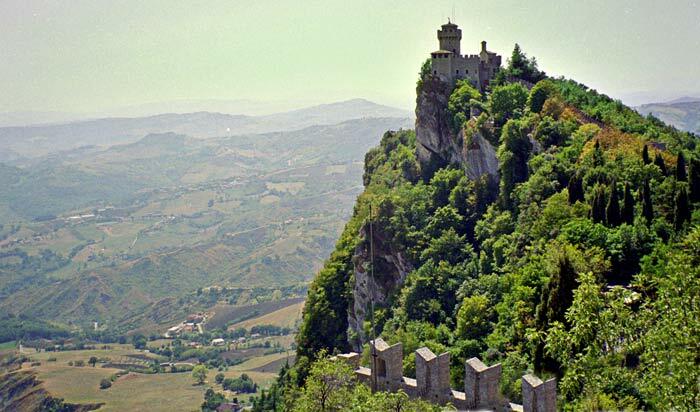 San Marino, the capital and most picturesque, but not most populated villa of this tiny country consists of sky diver views of Italy, the country below, across it's plains and out to the sea. In addition to this theme are streets full of touristy trinkets and a few historical sights, but little information on context (although the tourist office has some helpful information on that). The country was established on the basis of religious freedom. To avoid persecution, a Christian fled to the top of the mountain with some other followers and established their own government, as did many areas at that time, but this one somehow managed to avoid the unification of the area and separate from the hands of Rome. Today the country claims they are a symbol of world peace. Ironically, many of the travel shops deal authentic looking toy guns. Fortifications balance on the tops of this mountain area and the police direct traffic as if doing a ballet, but the other villas of San Marino on the way down the mountain are the seamless entry back into Italy.